Phoenix™ Jr. Intruder Beacon System | Strobes & Beacons | Adams Industries, Inc.
Phoenix™ Jr. Intruder Beacon System (NSN: 5855-01-539-0639) is a trip wire activated infrared beacon used in conjunction with night vision equipment to detect and signal night movement along trails, roads and entry points. 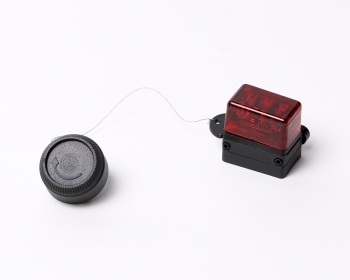 The system consists of the trip wire unit, one reusable 50 ft. line bobbins, an Allen wrench used for winding the bobbins, two magnetic mounts and the Phoenix Jr. Intruder Beacon. The Phoenix Jr. Intruder Beacon flashes at a rate four times faster than the Phoenix Jr., thus differentiating it from the standard combat identification signal. Alternatively the trip wire unit may also be used with any Phoenix or Pegasus flashing beacon, and is available for purchase separately without the Phoenix Jr. Intruder beacon. Several Intruder systems can be deployed to form a perimeter network requiring minimal NVD equipped sentries to patrol. Combat teams equipped with a GPS receiver can quickly deploy and accurately document the location of the intruder network. Once set up, the Intruder systems do not drain any power from the batteries until activated by the trip wire, maximizing the field longevity of the network. Size: 38.09 x 15.87mm | 1.5" x .625"